I truly believe there are no coincidences in life that they are signs. Here are some signs that gave me assurance that he was “the one”. Pictured above is my wish locket. Most of you don’t understand the meaning behind the name DjOneChain – Dj because of my love for music and in a sense I look at myself as a virtual Dj and the one chain symbolizes my wish lockets throughout my life. I have had unbelievable success with wish lockets. One day I hope to design my own line of wish lockets. I want to share with others this gift of hope and faith in this supernatural realm that we take for granted. Wishes backed by faith, imagination, and passion. 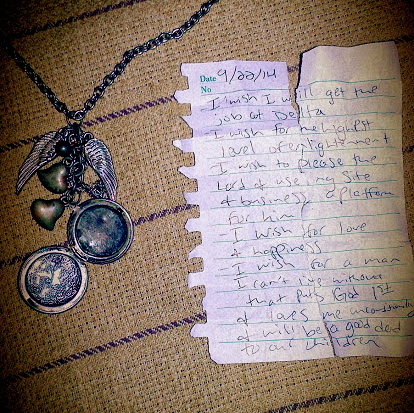 Since I was 8 years old I would write down my wishes on a tiny peace of paper, fold it up, and place it in the locket around my neck. They would ALWAYS come true. The picture above is a wish I wrote down on September 22nd of 2014 which was exactly 7 days before I met my now husband for the first time. 7 being unique because 7 is my lucky number. It’s the time I was born, the day I was born, and there are many other synchronicities that make it special. The first time I was introduced to my husbands parents his mom kept asking his father to play her late mother ‘s favorite song on the piano. After dinner he did and I immediately knew it was God who brought us together and that he was the one. The song was only one of 3 that I sing when I come home to see my granny. She would always ask me to sing for her when I would come home to the farm to visit. It just so happened that earlier that year before I left for my Guatemala mission trip I sang the exact song his father played for me that night for my granny at church, There’s Something About That Name, an old church hymnal. That night his father and I got to sing that song together and I can’t tell you what I felt inside… words cannot give it justice. All I knew is that I was exactly where I was supposed to be in that exact moment in time. Each struggle we go through makes us stronger. Each obstacle we overcome makes us more grateful for one another. Each day I find myself falling for him more and when he’s not looking staring at that gorgeous profile just a little longer than the day before. There’s no such thing as a perfect relationship. You work through hard times to appreciate the good. You sacrifice. You open yourself up each day exposing all your vulnurabilities molding this beautiful work of art called love. Throughout my previous relationships I´ve asked the same question, ¨How much do you love me on a scale from 1 to 10.¨ The answers varied but none were as special as his. 1) 10 is too restrictive of a scale – I can’t quantify my feelings for you in a number with only two digits. The scale to which compare is likened to the ever-expanding universe. 2) On a scale from 1 to 10 I love you in quantities comparable to how much helium has escaped into the atmosphere. 3) On a scale from 1 to 10 I love you in quantities comparable to the length at which all vascular systems of all plants that have ever been on earth would amount to if adjoined in a straight line. 4) On a scale from 1 to 10 I love you in quantities comparable to the distance traveled of every photon that has ever bounced off the face of the earth from the sun. 5) On a scale from 1 to 10 I love you in quantities comparable to the total number of grains of sand. 6) On a scale from 1 to 10 I love you in quantities comparable to the total number of stars in the sky. ***Feel free to take these one liners to the bank boys… they are sure to win the heart of your lady. Happy Father’s Day to “the one” God blessed me with on my journey. I am so grateful for all that you do for our little family. I love you more than you can quantify and cannot wait to welcome our baby wiggler to the world! You are going to be an amazing father just like yours.